A comprehensive guide exclusively for women who experience the pure joy of running—or want to. More women than ever are discovering the unique benefits of running -- for stress relief, weight management, endurance, and self-esteem. Women's bodies are not the same as men's, and though we can train just as hard and with the same passion for excellence, we have certain special concerns. 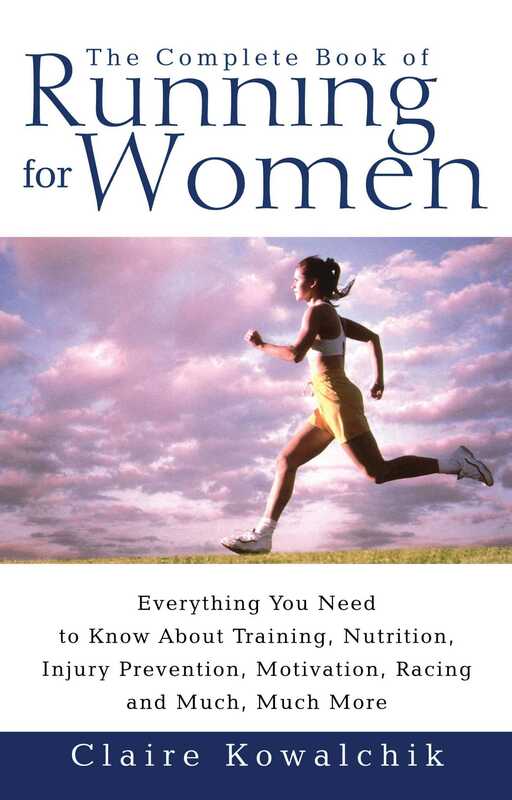 Authoritative and friendly, The Complete Book of Running for Women is a sourcebook for both beginners and long-time runners. Along with wisdom drawn from the author's personal experience, you'll find advice from the experts: coaches, exercise physiologists, nutritionists, doctors, and other women runners. Including question-and-answer sections and a complete list of resources, The Complete Book of Running for Women tells you everything you need to know to be off and running toward better health and richer living. Why take up running? Because it is the simplest, fastest, most accessible way to fitness and good health known to woman. You don't need a partner; you don't need equipment, a court, or a gym; and you don't need much time. A mere 20 minutes three or four times a week is enough to make you fit, although most of us find that 20 minutes isn't enough to satisfy our desire to run. Those who say they haven't time for running are simply making excuses. The morning, before the family wakes or work begins, is free time for most of us. If not, how about during your lunch hour or after you come home from the office? Just 20 minutes. It might seem difficult at first -- even the slightest changes in routine can take some getting used to -- but before you know it, you'll be figuring out ways to find 30 minutes, 40 minutes...an hour for running. Then there are others who say running is just too hard, too painful. They wrinkle up their noses at the mere thought of it. Running is hard, but that's one of the reasons we love it. We feel special as runners because we can endure. Besides, running gets easier. The reason many people say it's painful is because they go out for their first run and virtually sprint for as long as they can -- which isn't very long -- with their chest heaving, their tongues lolling, their muscles straining until finally they can go no farther. They stop and pant, hands on their hips, wobbly kneed. "I -- gasp -- hate -- gasp -- running," they say. So would I if I ran like that every day. Running is not an act of will over body -- the brain whipping the legs to go as fast as they can as long they can (except when you really are sprinting). When you're running, your mind and body work in tandem toward an enjoyable continuum of movement over the ground. In the beginning, when your body is not yet capable of blazing speeds, your mind should say, Okay, slow down. Let's go at a pace that's comfortable for you. Now that you don't have any excuses not to start, here are several reasons to begin running if you haven't already and to continue running if you have. Let's compare running to another popular and convenient fitness activity -- walking. In 20 minutes of running at a relaxed 10-minute-per-mile pace, a 130-pound woman burns 200 calories. In 20 minutes of walking at 15 minutes per mile (a brisk pace), a 130-pound woman burns only 72 calories. Of the 200 calories burned running, roughly 100 come from fat and 100 from carbohydrates. The 20 minute walk burns 54 fat calories and 18 carbohydrate calories. Furthermore, studies show that running increases your resting metabolic rate (meaning you burn more calories even when you're not active) and improves your body composition by reducing body fat. The clear result of all of this is a leaner, trimmer figure. Vanity aside, managing your weight is one of the most important things you can do for your health, well-being, and longevity. Obesity is a heavy contributor to heart disease, high blood pressure, stroke, breast cancer, and diabetes. In the Nurses Health Study of 73,029 women aged 40 to 65, conducted by JoAnn E. Manson, M.D., of the Brigham and Women's Hospital and Harvard Medical School in Boston, the rate of heart attack was found to be 44 percent lower among the most active women compared with those who were sedentary. Running reduces the risks of blood clot formation. Running lowers blood triglycerides (fat). Running lowers total cholesterol levels. Running raises levels of high-density lipoprotein (HDL) cholesterol, also known as "good" cholesterol. Running prevents the stiffening of arteries that comes with age. High mileage seems to have the best effect on raising HDL cholesterol levels, whereas running faster is better for lowering triglycerides, according to a study by Paul T. Williams, M.D., of the Lawrence Berkeley Laboratory in California. Williams's research looked at 1,837 female runners who were grouped according to weekly mileage: 0 to 9, 10 to 19, 20 to 29, 30 to 39, and 40 or more miles. HDL cholesterol levels rose with mileage -- those in the 40-plus mileage group showing the highest levels. Also, as mileage increased, heart rate and body mass index (BMI; a calculation of weight based on height) decreased. Williams concluded that women who run 40 miles or more a week decrease their risk of dying from cardiovascular disease by 45 percent. He pointed out, however, that significant benefits are accrued at lower levels of weekly mileage as well. Williams also noted in his study that running lowered blood pressure and heart rate. Though the women who put in more weekly mileage showed the lowest figures for blood pressure and pulse, Williams found that fast running seemed to have an even greater effect -- a good reason to do speed training and take up racing. Given that running helps lower blood pressure and keeps the cardiovascular system healthy, it's not surprising that it can also help prevent stroke. A study conducted by researchers at the University of Alabama at Birmingham and reported in the British Medical Journal (July 24, 1993) compared 125 men and women who had just had their first stroke with 198 men and women who had never had a stroke. In looking at the activity levels of these groups, the researchers concluded that vigorous exercise -- defined as running, swimming, cycling, and other strenuous activities -- "confers substantial protection against stroke. These effects were seen in both sexes and all age groups." The Nurses Health Study also shows that exercise prevents stroke, finding that active women have a 42 percent lower rate of stroke than do sedentary women. For several years, health experts have suspected that physical activity may lower the risk of breast cancer, and recently a significant study reported in the New England Journal of Medicine supports this theory. Over a 13-year period, researchers in Norway studied 25,624 women aged 20 to 54. They grouped these women according to level of activity: sedentary, moderate exercisers ("those who spent at least four hours a week walking, bicycling or engaging in other types of physical activity"), and regular exercisers ("those who spent at least four hours a week exercising to keep fit and participating in recreational athletics" plus "those who engaged in regular, vigorous training or participated in competitive sports several times a week"). They found that the regular exercisers -- the most active group -- had a 37 percent lower risk of breast cancer compared with the sedentary group. The moderate exercisers showed a 7 percent lower risk. When looking only at premenopausal women, the risks of breast cancer were even lower with physical exercise. "Our results support the idea that physical activity protects against breast cancer, particularly among premenopausal and younger postmenopausal women," the researchers concluded. The theory behind the protective effects of activity is that vigorous exercise, such as running, may suppress the secretion of estrogen and progesterone, which have been linkedto breast cancer. Also, the lower levels of triglycerides seen in physically active women reduce the amount of estrogen in the bloodstream. Running also prevents that natural decline of immunity that occurs as we age. In 1993, David Nieman, Ph.D., and colleagues at Appalachian State University in Boone, North Carolina, compared the immune systems of active elderly women (who had been exercising aerobically for more than an hour a day for several years), sedentary elderly women, and sedentary young women aged 19 to 25. They found that the activity of T-cells and natural killer (NK) cells-two types of lymphocytes essential to immune function -- was significantly higher among the active elderly women than in the sedentary elderly group and comparable to that seen in the young women. "The T-cells of the elderly active women were functioning like those in women half their age," says Nieman. Other good news: a 1997 study of women, activity levels, and causes of death showed that those who were most active had a considerably lower risk of death from respiratory diseases than did sedentary women. Running burns glucose (blood sugar) for energy, which helps prevent glucose levels from rising too high. This doesn't mean that diabetics don't still need insulin, but they may be able to use lower amounts. Running also improves circulation, which commonly deteriorates with diabetes. Regular running can keep you regular. This, in combination with a diet rich in fiber, lowers your risk of colon cancer. When you run, your muscles require a quick delivery of oxygen. The more you run, the more efficient your respiratory system becomes and the easier breathing is. Though running can stimulate an asthma attack in runners who suffer from exercise-induced asthma, the fitter you become through running the less frequently you should experience such episodes. Some women have reported that running has enabled them to cut back on their use of asthma medications. Scientists have no proof that exercise relieves the pains of premenstrual syndrome (PMS), but many women report that even though they may not feel like running when their period hits and they're bloated and suffering cramps, once they go for a run, they feel much better. If physical symptoms don't subside, the moodiness -- irritability or depression -- that some women experience may dissipate after a good run. We now know that most women can continue running safely during pregnancy. Those who do gain less unnecessary weight, sleep better, have better appetites, and generally enjoy better moods than do women who are sedentary. Running may also help prevent gestational diabetes and may contribute to shorter or easier deliveries, although not all runners can attest to this. When you've stepped beyond your childbearing years, you may find that running eases the discomforts of menopause by improving sleep patterns and stabilizing erratic moods that often accompany this period of changing hormones. It also helps control weight gain associated with this time of life. Running keeps the muscles of your legs in good shape as you age, but you'll need to do some regular weight training to maintain strength in your upper body. As for your bones, the forces that running exerts on your skeletal system stimulate bone formation and increase density. The effects are greatest in the legs, hips, and spine, the latter two areas being the most common sites of osteoporosis and fracture later in life. You can use resistance training (weight lifting) to build the bones of your upper body. Contrary to what most people believe, regular running does not ruin your joints; rather, it improves their flexibility and range of motion. "Running doesn't cause arthritis; injury does," says Warren Scott, M.D., chief of sports medicine at Kaiser Permanente Medical Center in Santa Clara, California. "Exercise is good for osteoarthritis. It speeds the rate at which cartilage is replaced by your body, making it stronger." Regular exercise has been shown to keep your mind sharp and reaction time quick. As you get older, quick reactions, good muscle tone, and overall flexibility help prevent accidents, such as falls. That running can help you live longer and feel happier comes as no surprise, since running helps prevent heart disease, stroke, cancer, diabetes, and osteoporosis and strengthens your immune system. In a study reported in the Journal of the American Medical Association (April 23/30, 1997), Lawrence Kushi, Sc.D., and his colleagues at the University of Minnesota School of Public Health looked at a group of 40,417 postmenopausal women between the ages of 55 and 69. They found that the most active women showed a 30 percent lower risk of death from all causes compared with those who were least active. Add to that the physical strength and emotional well-being that running gives us, and we can look forward to a vibrant and happy, long life. Claire Kowalchik is the author of The Complete Book of Running for Women, Rodale’s Illustrated Encyclopedia of Herbs, Runner’s World Running on Air, and Running Strong.